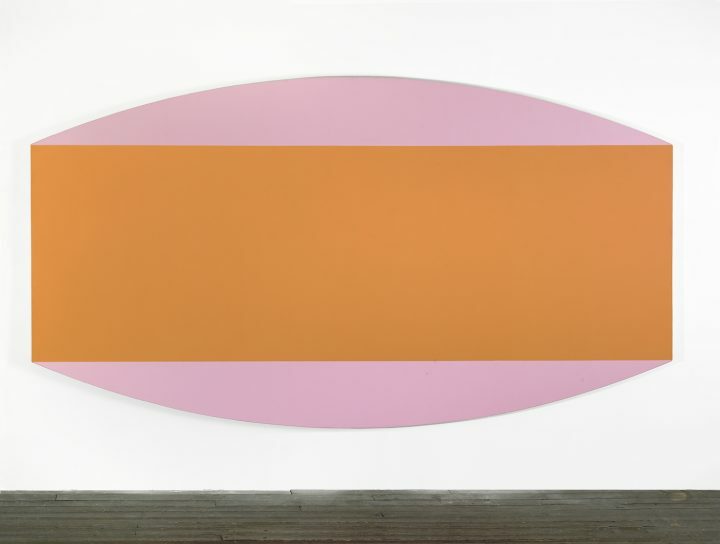 Olivier Mosset’s career could almost be seen as a grand Fluxus-style gesture of quiet provocation. From February to April 2016, the Hunter College Art Galleries’ downtown space on Hudson Street presented an exhibition on the historical French group BMPT. Short-lived but influential, the group formed in Paris in 1967 and dissolved in 1968. Curated by Joachim Pissaro and Annie Wischmeyer, this was — to my knowledge — the first formal introduction of BMPT to an American audience. 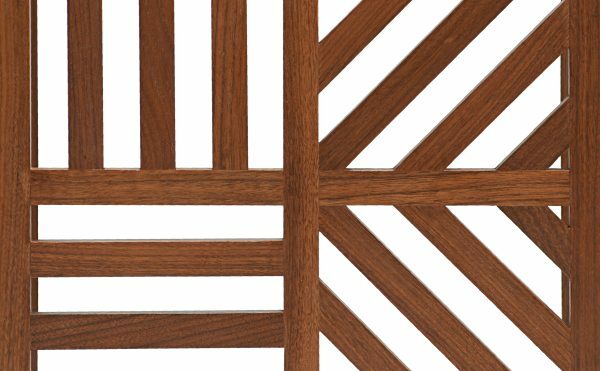 The acronym BMPT was coined from the first letter of the last names of its four members: Daniel Buren, Olivier Mosset, Michel Parmentier and Niele Toroni. BMPT came out of a moment in pre-1968 Europe, when the planets seemed ideologically, if briefly aligned for a few avant-garde groups and trends, such as Lettrisme, Neo-Dada, Zero, Fluxus, Nouveau-Réalisme (a French version of Pop-Art) and monochrome abstraction (Yves Klein). Combining a zero sum approach to painting with Situationist-style tactics, BMPT turned formalist reduction into a political statement, which is why it remains relevant today. The group was highly controversial when it emerged, and it dissolved rapidly over predictable disagreements between its members after the withdrawal of Michel Parmentier in 1968. It is generally seen as a direct predecessor to the Supports/Surfaces group (1968–72). 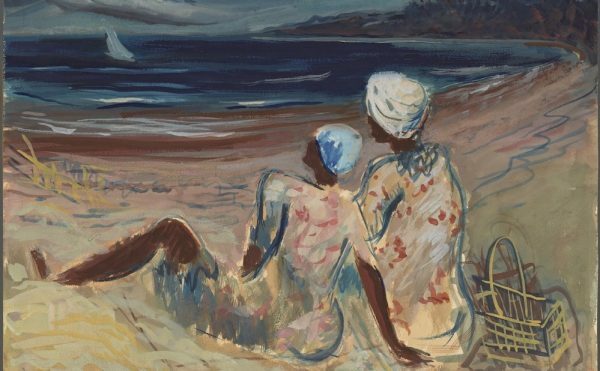 After the breakup, the remaining members pursued careers separately, further developing the concepts they had formulated together, such as the critique of painting as a symbol of the institution, and painting as a self-referential critical tool — the object as well as the subject of the critique. Daniel Buren, the best known of the group, has had an episodic but regular presence in New York — at the Guggenheim Museum in 2005 and last year at the Bortolami Gallery. Buren became famous for his critique of painting as a symbol of the institution from within the institution, a critique quickly embraced and absorbed by the institution itself. He is now viewed as an “official” artist in France, accumulating countless public commissions, perhaps the most notorious being his 1986 “columns” installed in the cour d’honneur of Paris’ Palais Royal. Niele Toroni’s work was shown at the Swiss Institute in Soho during the summer of 2015, and with Michel Parmentier’s first one-person exhibition in the US at the Tribeca gallery Ortuzar Projects this past winter, New Yorkers have now been acquainted with the last piece of the BMPT puzzle. What separates Olivier Mosset from the rest of the group, however, is his rejection of a signature style. Buren owns the vertical stripes — and was upset when Mosset showed stripe paintings in 1974 — while Toroni has turned the size # 50 brush mark into a signature style and Parmentier explored folded and spray-painted horizontal bands, but Mosset never laid claim to a specific trademark. After finishing his 200th (or so) circle painting in 1974, he became a sort of vagabond in the landscape of abstraction, borrowing here and there in the modernist repertory to accumulate whatever he needed for his next show. 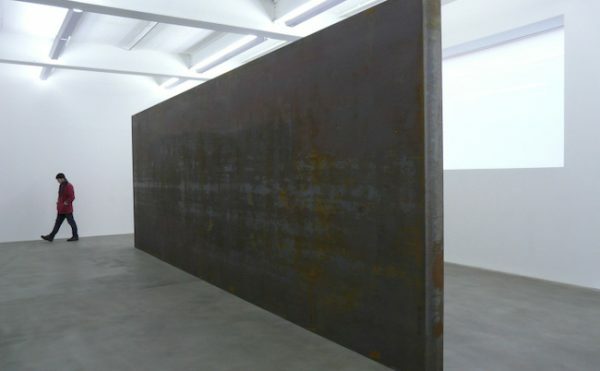 He is also the only one of the group to have taken the full measure of Abstract Expressionism and Minimalism. He moved to the US in 1977, and since then has become a regular presence on the New York art scene. Over the years, he has turned into a legend of sorts for abstract painters on both sides of the Atlantic. Cultivating, at first, an outlaw persona derived from movies such as Rebel Without a Cause or Easy Rider, with a whiff of Jack Kerouac and a copious side dish of Hell’s Angels esthetics — a combination that not only speaks volumes about the pull of American pop culture over Europe in the early ‘60s, but also offers a glimpse into the nomadic nature of his practice. 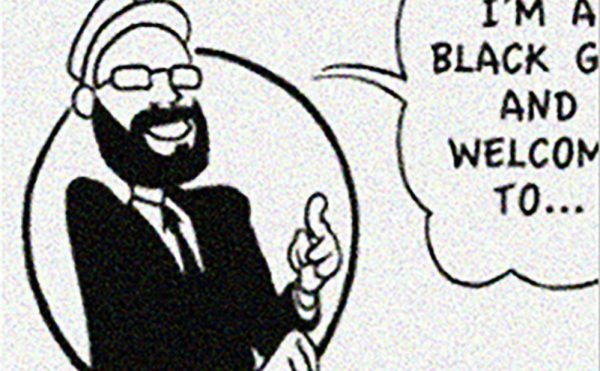 He now boasts the look of a prophet — long hair, beard and all. Through his friendships and collaborations with countless American artists and critics (Marcia Hafif, Steven Parrino, Cady Noland, and Bob Nickas come to mind, though there are many others), he has achieved more than many of the institutions that have attempted it, a rapprochement between the American and European art worlds. Until he left for New York, Mosset seemed comfortable with Clement Greenberg’s formalist precepts of flatness and self-referentiality. But the convergence of Greenberg’s self-referentiality with BMPT’s critical self-referentiality in painting was short-lived. Mosset’s relationship to Greenberg is ambiguous at best. While professing respect for Greenberg’s ideas, Mosset actually pushed them s to their ultimately absurd and self-defeating conclusions, very much in line with a Fluxus approach of turning ideology against itself. But the same ambiguity applies to his relationship with Marcel Duchamp. In an interesting reversal, after rejecting the Nouveaux Réalistes’ use of the objet-trouvé when he was in Paris, and after discovering that abstraction and the ready-made could not mingle in the New York art world of the 1970s (the mechanics of which have been thoroughly examined by Thierry de Duve in his landmark 1996 essay collection Kant after Duchamp), Mosset became the most Duchampian of abstract painters. He paints from a place equidistant from Greenberg and Duchamp, equally skeptical of Greenberg’s fetishism of the surface and of Duchamp’s fetishism of the object. Mosset operates in the gap between the found object as defined by Pablo Picasso and Kurt Schwitters and the readymade as defined by Duchamp, a gap where Claude Lévi-Strauss’s notion of “bricolage” (tinkering with, tampering with) sneaks in under the guise of assemblage or accumulation — a notion very relevant to the artist’s early days in Paris as assistant to Swiss compatriots Daniel Spoerri and Jean Tinguely. As we will see later, Spoerri is the key figure here, with his concept of “tableaux-pièges” (trap paintings) and his close association with Fluxus. Bricolage subverts the seriousness of both art and craft. It fluctuates somewhere in the middle, paying no respect to either of them. Introduced by Dada and used more systematically by Fluxus, bricolage has its own tradition in Modern Art, which would eventually lead to the deconstructive approach of the Supports/Surfaces group in the early ‘70s. With bricolage, we are bearing witness to the de-sacralization of the object against its fetishization and sacralization in the readymade. What I want to suggest here is that Mosset tampers with abstraction in a way similar to Arman’s tinkering with the objects in his accumulations. Mosset’s relationship to abstraction therefore is one of “bricolage” (in the best sense of the term), in which abstraction is seen as a field to be tampered with, and that conceptual bricolage is the agent of this subversion. With the aim of desacralizing what was currently being fetishized, Mosset toyed with Buren’s bands (1972-74), and then with the idea of the monochrome (1977–84). He later took on with Ellsworth Kelly’s hard-edge abstraction and shaped canvases. 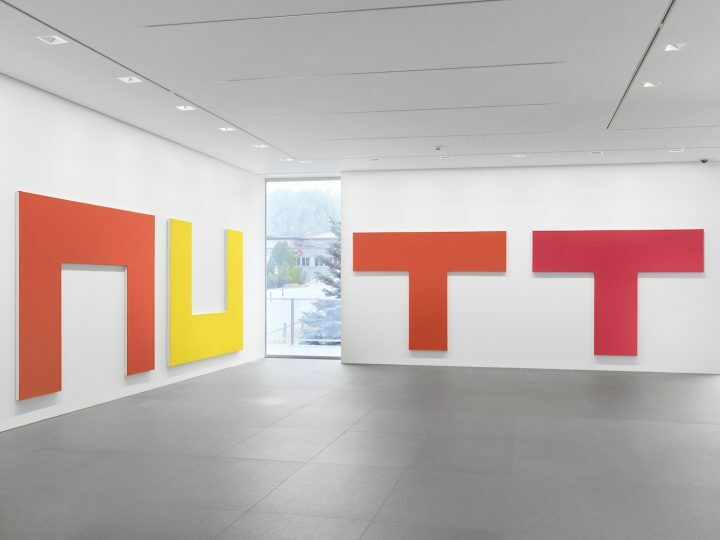 More recently, he has dealt with text in his letter paintings (the Mutt-Tum series of 2013) while playing the field and mixing up all of the above, with hints of humor occasionally breaking through (in the Cocottes paintings, for example). These moves have made his work impossible to pin down stylistically, even as it has maintained conceptual consistency. After the 1984 Radical Painting exhibition at Williams College, Mosset distanced himself from the group represented in that show as well, feeling that the monochrome was being reinvested with an aura that he was trying to avoid. 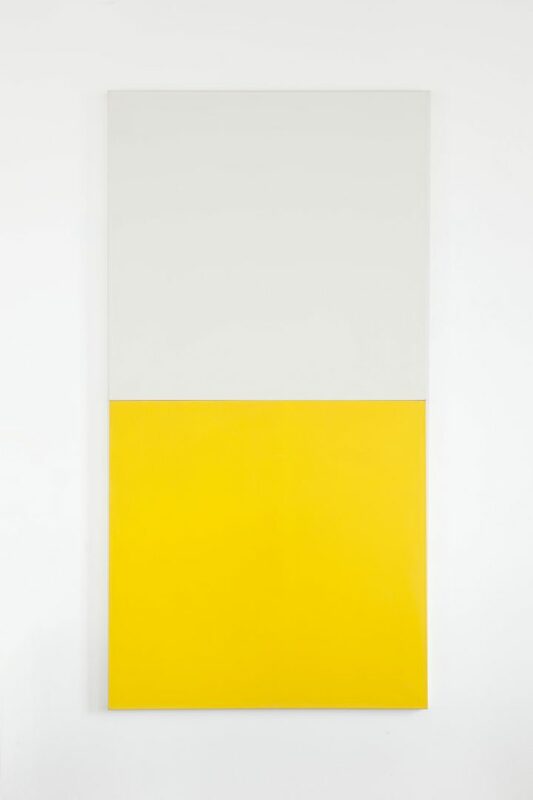 Mosset’s choice of monochrome did not come out of a need to reduce painting to its essence but rather, it was driven by a materialist search for the bare minimum that makes a painting possible. It is significant that when Mosset moved from monochromes to abstract paintings in the mid-‘80s, he saw it as a “step backward,” a regression from monochrome as it was then understood: the ultimate form of abstraction. But this was a view that made sense only if one still pledged full allegiance to the formalist reduction narrative. For Mosset, the only way to advance in painting was to regress to a pre-monochrome mode, a contradiction with the formalist ideal of continuous, linear progress. What that “step backward” truly signaled was the moment when abstraction finally stepped outside of the Greenbergian narrative. What Mosset conceives is not a “found painting” per se, but an abstract painting as a found object — and not, it should be stressed, as a readymade — a significant conceptual difference. Mosset’s painting is a composite of different found (or borrowed) sources: found shapes, found colors, found processes, found titles, etc. 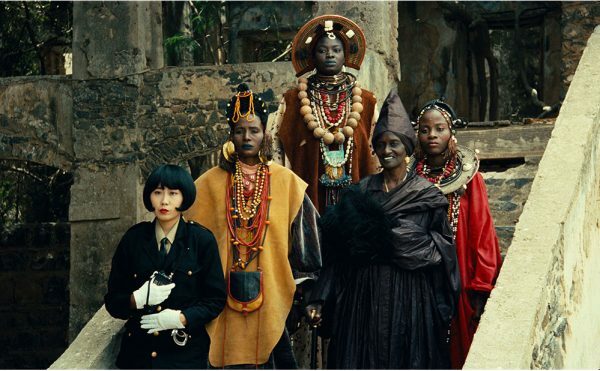 It is important to keep in mind that these elements are borrowed, as opposed to appropriated, in the sense that he never lays claim to the “appropriated” material. A painting that is intentionally non-interesting, without quality — evoking, as Catherine Perret has pointed out in Olivier Mosset: Painting, Even (Ides et Calendes, Neuchatel , Switzerland, 2004), Robert Musil’s 1943 novel The Man Without Qualities — a kind of painting that reveals little about itself and nothing about the painter. It is very difficult to speak of painting today, because it is difficult to see it. 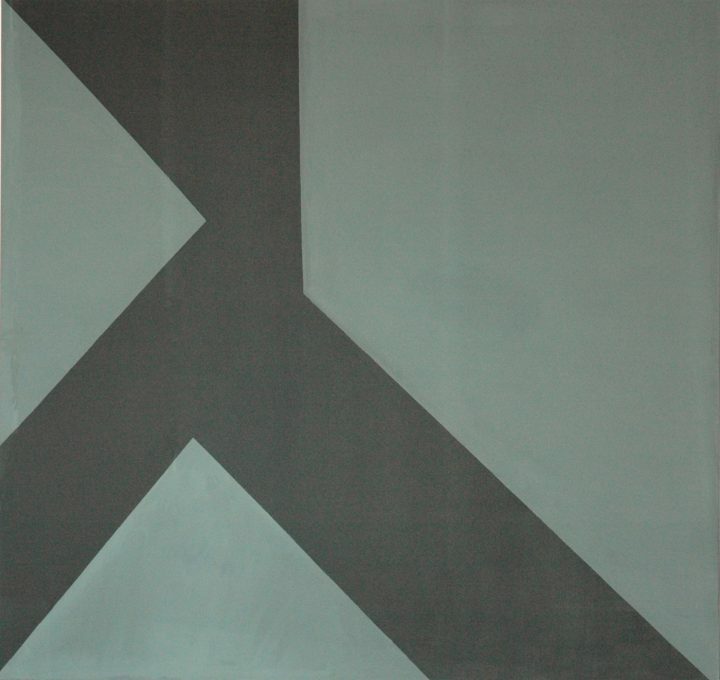 It is as if painting, geometric abstraction in particular, doesn’t wish to be seen and doesn’t wish to concern you. It is the most economical, elliptical and allusive form of exchange possible. The best description of this discourse is that it has nothing to say, the equivalent of a painting where there is nothing to see. The equivalent of an object that is none […] Thus a painting that is none, a form that is none […] a color that is none. (In the monochrome […] there is still the question of color that is none since it rejects the interplay of difference: it plays with the paroxysm of indifference in that it does not “regard” you) […] an object that is not an object is not nothing. It is a pure object which doesn’t cease to obsess us with its own immanence, its empty and material presence. The problem is to materialize nothingness, to trace the filigree of the void at the edge of the void, to play according to the mysterious rules of indifference at the limits of indifference. As his focus shifted away from the paintings proper, it re-centered around installation strategies. Over the years, Mosset has used a wide array of devices to contextualize his paintings. For the purpose of this article I will focus on two specific examples: the Toblerone sculptures and the motorcycle installations. Started in 1994, the Toblerone sculptures (replicas of massive concrete anti-tank defenses installed on Switzerland’s borders to prevent an invasion during World War Two, named “Toblerones” because of the resemblance of their shapes to the chocolate bars of that name) are often shown in front of the artist’s paintings, intentionally blocking their view in order to repel the viewer’s armored expectations. 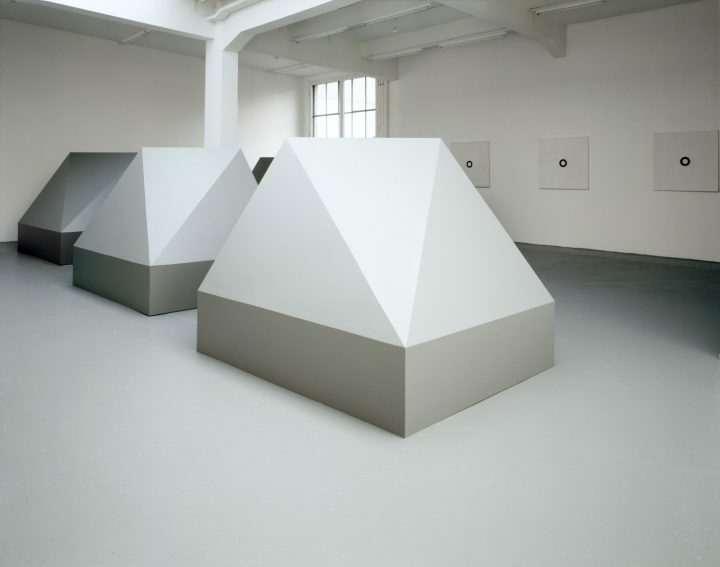 They were initially selected as found objects with a sly nod to Tony Smith’s sculptural shapes (Mosset’s paintings and sculptures often operate with a degree of oblique references to Minimalism). 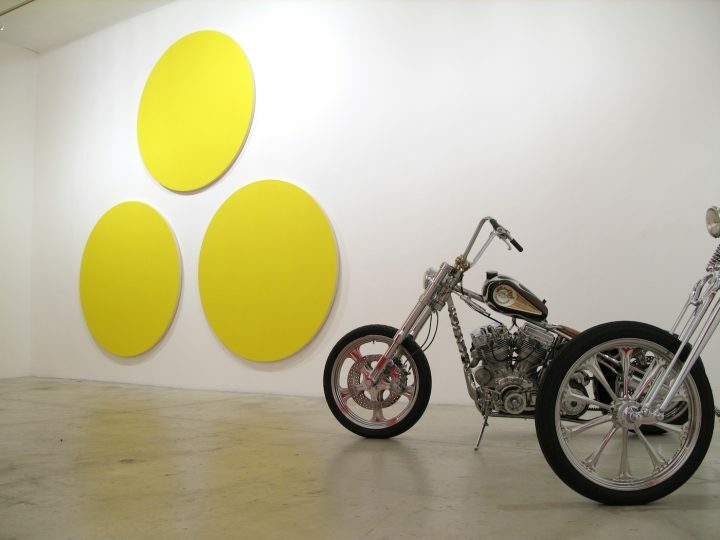 Last year at the Hunter College Art Galleries on 68th Street in Manhattan, he exhibited paintings alongside highly customized motorcycles, a combination he has been employing since around 2010. By putting painting to the test of the readymade, he has been gauging it s against its own fetishism and exposing the gap between painting as a found object and the real-world object as a readymade. The juxtaposition also places the viewer between the opposite poles of his practice: Greenberg on the wall; Duchamp on the floor. But Mosset goes further than just wondering whether a painting can hold its own next to a kind of hyper-readymade, he purposefully tips the scale towards the motorcycle and stacks the odds against the paintings. How, in such a context, can the paintings’ mute surplus of absence possibly resist the motorcycle’s macho surplus of presence? The face-off revolves around a combination of projected desires. The seductiveness of a customized Harley-Davidson, a symbol and object of male desire, is poised against the painting’s resistance to seduction. The Harley genders the viewer’s gaze as a male, positing both painting and motorcycle as objects of desire, just as Duchamp had assumed the viewer’s gaze to be male in the Large Glass (1915–1923) and Etant donné (1946–1966) — only to deftly reverse the roles in his Rrose Selavy incarnation. What began here as an argument between Greenberg and Duchamp is now drifting towards the quicksands of gender politics. Mosset’s entire enterprise is one of distraction, of redirecting the viewer’s attention away from the paintings, whether by making the paintings disappear into the wall (as in his monumental work for the 1977 Biennale de Paris) or by interfering with their apprehension, placing as much obstruction (the Toblerones) or distraction (the customized motorcycles) as possible between them and the viewer. Painting is being tried in the court of the distracted gaze, as if to prove whether it can hold its own even when the viewer doesn’t notice it. If his paintings are mute, it is because their main purpose is to deflect interpretation and push painting as far as possible towards its status as object, while paradoxically remaining true to its immaterial aspirations. What anchors Mosset’s work firmly on the latter is his insistence on painting’s propensity for failure: objects never fail as objects, but paintings sometimes fail as paintings. Tellingly, the larger the paintings, the more invisible they are. They are passive, mute, opaque, and non-existent as objects of desire. They provocatively sustain our distraction. Contrary to Spoerri’s trap paintings, ensnaring viewers by surprise, Mosset’s work releases viewers from their responsibility to engage. These are push-back paintings of sorts, much like the anti-tank defenses; they push back against our own expectations, while also deflecting our interest. Catherine Perret, in an email conversation with the artist (“Conversation avec Olivier Mosset,” Olivier Mosset, Les presses du reel, 2007), and Bob Nickas, in “Olivier Mosset; some thoughts about values” (Live Free or Die, Les presses du réel, Dijon, 2000), have separately insisted on the recurring question of the value of painting with regard to Mosset’s work. By creating intentionally artificial pairings, the motorcycle and the painting, for example, Mosset exposes the failure of painting to function in the realm of the readymade, in other words, in the realm of use value and exchange value. Instead, the pairing makes clear that painting evolves in the realm of symbolic value. The critique of the art system has often been done from a neo-conceptual standpoint, but rarely from a painting standpoint, since painting has been the standard scapegoat of the conceptual critique. In both cases, however, the objects produced can never be seen simply literally: no matter how literal they are, paintings still operate symbolically (as symbols, within the symbolic system of art) and it is precisely for this reason that they have any exchange value — for the individual viewer, for their historical moment, and for society at large. One could understand Mosset’s work as abstraction with a socio-political conscience, where conscience is embedded in the medium instead of the message. 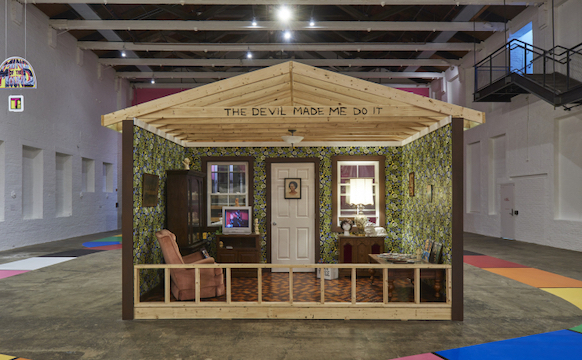 The artist has been particularly adept and conceptually agile in adapting his materialist (here in the Marxist sense) platform to the changing art world context. Nonetheless, in many ways Mosset’s work still defines itself in terms of pre-May ’68 dialectics, even if these terms have long run their course — as has the Greenberg/Duchamp antagonism. But by constantly shifting his angle of approach to the same problem, he has managed to keep the flame alive and to surprise us with every new show. Mosset’s entire career could almost be seen as a grand Fluxus-style gesture of quiet provocation (were it not for Fluxus’ proclaimed aversion for painting, especially abstraction) — a ludic/lucid commentary on abstraction as an exercise in contradiction, a balancing act of staying engaged with the most current debates in art, while courting anonymity by avoiding ownership of any specific style or allegiance to any specific school. Toward the end of his 1989 essay “The Monochrome and the Blank Canvas,” Thierry de Duve wondered why no artist had yet directly tackled the blank canvas as a readymade. Might I suggest that Olivier Mosset possibly came closest? t And yet, by redefining painting as a found object, he avoided the dead ends that both the monochrome and the readymade seemed to inevitably lead to.